Check current market values for your home and view a potential buyer pipeline. Register to access our full suite of advanced web based tools, including advanced search, saving searches, creating favorites folders, and receiving e-mail notifications. Allow me to help you directly! Contact me today! Download My FREE Property Search App! Peachtree City Real Estate! - Peachtree City Homes for Sale! Peachtree City is a planned residential community located south of Atlanta in Fayette County, Georgia. It is home to over 30,000 residents who enjoy a way of life that is truly community-oriented. 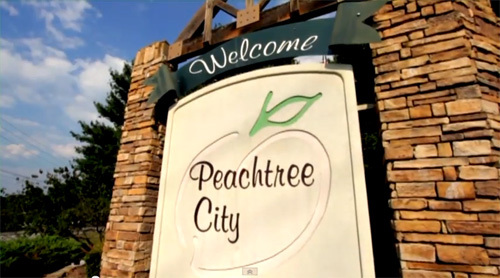 Peachtree City was designed to connect residents to each other by way of amenities such as golf cart paths, recreational centers and organized events and programs for residents of all ages. Many people consider Peachtree City as much a lifestyle as a place to live. Please sign into Homefinder now and then search for Properties. Browse our Peachtree City Ga area comprehensive database, view pictures and information, save any favorites for future viewing, allow the system to notify you whenever similar homes come on the market, and then give us a call for immediate assistance. This Peachtree City area website has been created to provide in a very user friendly manner, a one-stop shopping experience for whomever is interested in seeking out Peachtree City real estate and home sales advice, mortgage info, current interest rates, moving solutions, school information, buyer/seller advice, and price your home analysis for Peachtree City, Fayette, Coweta and surrounding counties. This sprawling community sits on 15,000 acres, strategically located just outside of Atlanta. Peachtree City is actually comprised of four distinct villages--Braelinn, Aberdeen, Glenloch and Kedron. Within these villages, there are over 100 neighborhoods! Residential life is centered around carefully planned green spaces, shopping districts and recreational facilities. Peachtree City boasts three championship golf courses, its own business district and several community centers. The cities recreational department offers youth and senior programs all year round, and all take advantage of educational opportunities and activities at the new Kedron Field house and Aquatic Center. From any point, residents can walk, bike or rollerblade through their neighborhoods on the 80 plus miles of pathways that link all areas of Peachtree City. Lake Kedron, a 500-acre lake located in the newest village of Peachtree City, offers a quiet place to camp, fish or just relax. With a well-planned layout that allows business, commercial and residential real estate areas to exist together in harmony, Peachtree City is considered one of the Atlanta areas premier addresses. It truly offers something for everyone! There are several other interesting aspects to the Peachtree City area. Please click on a few of the following links to discover more, not only about Peachtree City, but Fayette and Coweta County as well. If you are interested in how many Peachtree City homes have sold, how many are on the market, the Peachtree City area listing price/sold ratio and many other vital home buying statistics please click on Peachtree City Monthly Market Update and see for yourself. Please request our free Peachtree City area relocation Package or view our online community brochures. Home Sellers! Please browse our new Home Staging page. It will help you sell your property! Home Buyers. Please Review our International MLS.